Embellishing is so much fun! The level can range from fully encrusted to just a few seam treatments. Embellishments in darker colors, such as blues and purples would be a nice contrast against the white – and would coordinate nicely with darker (AKA: Mom) jeans. Polymer Clay Goddess Face cabochons encrusted with beading seem to be a theme with me (although my niece recently informed me they are “scary”). 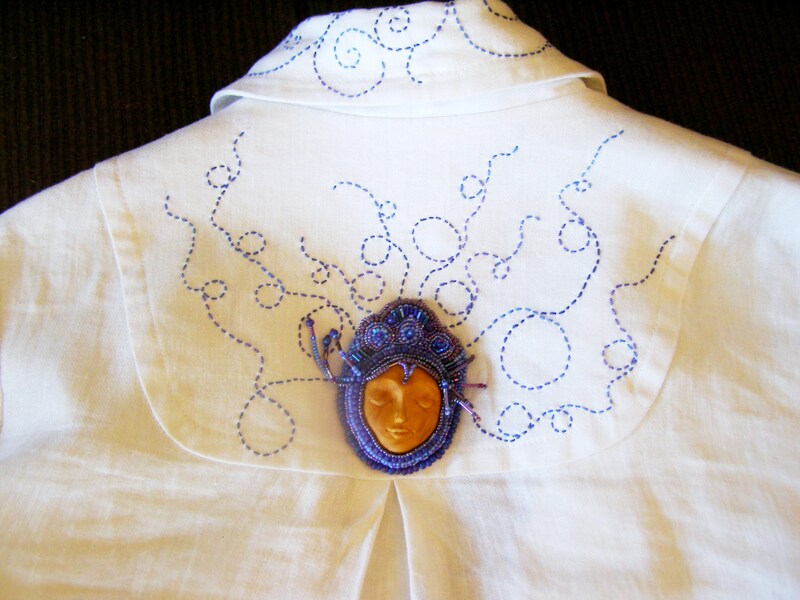 The image in the Destashification Project Banner is the cabochon on the back yoke of this jacket. 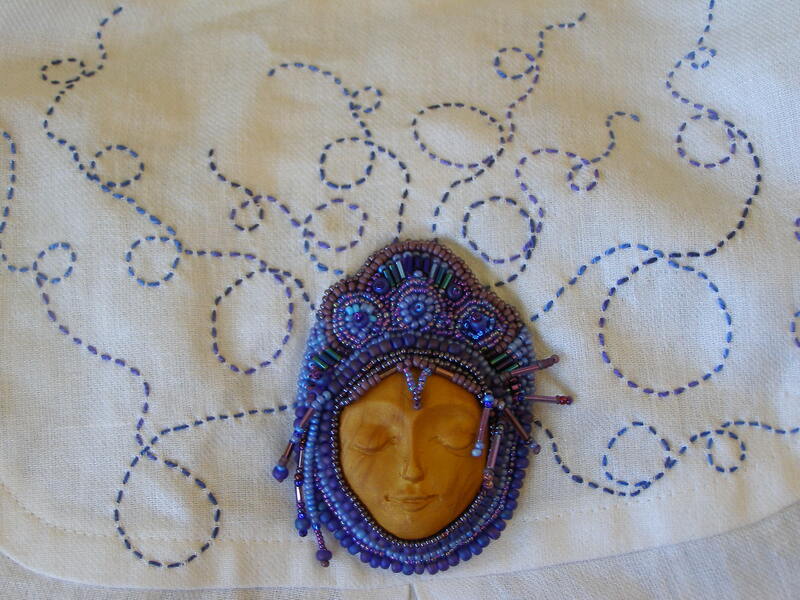 The purple and blue beading stand out on the white linen. Now that I look at this picture, I think the jacket needs a bit more embellishment. It is still too much stark white – maybe on the packet flaps and extending from the lace on the sleeve. The button on the jacket is a fabric covered button encrusted with beads to balance the heavy beading on the cabochon on the back. 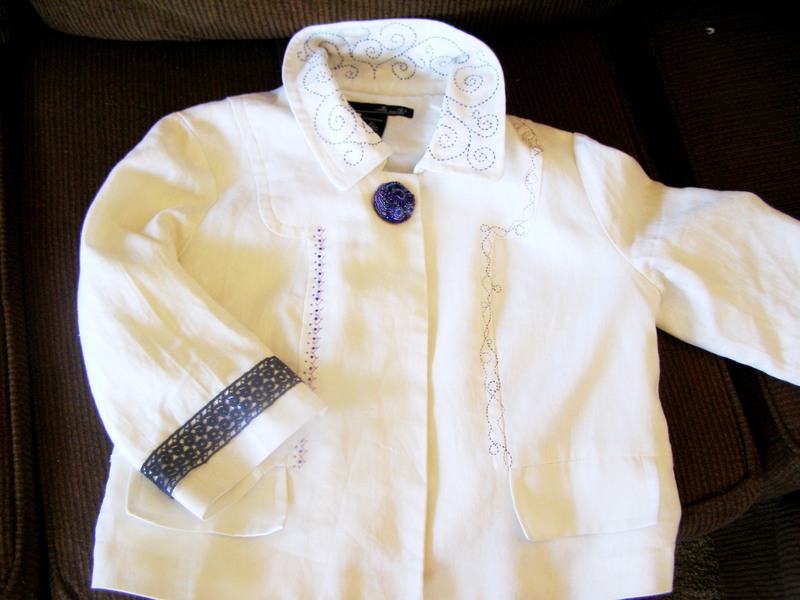 This entry was posted in Embellishment, Goddess, Stash Couture and tagged beaded button, embellished jacket, embellishment. Bookmark the permalink. I absolutely love your goddess-face cabochons. She looks happy and serene and your beading around them is exquisite. Thanks. Those cabochons are so much fun to make. I am working on another prom purse in a blue, purple and aqua colorway with a slightly different cabochon. Hope to have pictures up soon.